This is a semi-formal apology. What are you apologizing, you may ask? Well, as we realized we didn't have a new trailer or screenshots to show this Christmas – unlike in two past Christmases – we decided we would make a very special announcement instead. Like, VERY special. Sadly this didn't happen. The fault is not ours nor the awesome folks hosting our site, but the storm that struck Finland during the holidays. I use a cable connection and when the cables were damaged, my Internet was gone – and since it was the Holidays I couldn't get an USB modem on such a short notice. Then again, the storm was Finland's strongest in a century, causing blackouts and havoc across the country, so I refuse to complain about the Internet being down for four days. But fear not; We re-scheduled the announcement for January 2012. When you see it you'll likely agree with us in that there really is no better way start 2012 at TAGAP.net. I again have a pre-paid USB modem at hand, so the annoucement will happen, cable or no cable. And remember that we have the TAGAP 2 sweepstakes is still on; Perhaps you'll be one of the lucky ones to own the TAGAP 2: Overdose Edition! While there is practically no snow in sight here in southern Finland, the calendar does claim it's Holiday Season 2011 – and it's time for our four-years-and-counting tradition of Weekly Penguin Season Greetings eCard! As always, If you haven't you're your eCards yet, feel free to use this one. And remember that we have the TAGAP 2 sweepstakes running all the way through the holidays, so if you have a moment between dinners with family and friends, feel free to participate. Today marks one of the coolest anniversaries in ages. You know, literally. On December 14th, 1911, the South Pole expedition led by the legendary Norwegian explorer Roald Amundsen arrived at South Pole. Amundsen embarked on the expedition in June 1910. Ironically, most of his crew believed they were headed to the North Pole – which was conquered in 1909 – but little did they know how legendary exactly their journey would become. So, take a moment today to hug a penguin plush while sipping a nice, cold drink with ice. Heck, I know I will. Sweepstakes: Win TAGAP 2: Overdose Edition! You might have heard of the rare 30-copy limited wonder that is TAGAP 2: Overdose Edition. And now you have a change to get yours! All you need to do is to give us feedback on TAGAP 2. What did you like about it? What you didn't like? Was there something you wished it had featured? Anything goes! The contest is open until January 6th 2012 and the winners will be picked on random from all participants using Research Randomizer. After several months of hiatus TAGAP blog returns. This first post-launch blog dissects the launch of TAGAP 2, the state of freeware games in general and ponders on the next project Penguin DT (that's us). Also, as the blog reveals, the promised sweepstakes contest is near and in a week or so you all will get the change to win one of those TAGAP 2: Overdose Editions. Stay tuned for that. It's Halloween time – and since TAGAP 2 has a graveyard level, why not turn it into a season-apt gameplay trailer? So, without any further ado; TAGAP 2: Halloween trailer. Have an appropriately creepy Halloween! And here comes TAGAP 2 v1.4 update. This update fixes the issue of half-blacked-out co-op in-game cutscenes when one of the players is dead – and tweaks a slew of things behind the scenes improving stability, performance and cross-OS compatibility. For full list changes see the version history. As usual, the update is available as both an update and full installer. Again, since the update is only 1.8 Mb as opposed to 211 Mb full installer, using the update is strongly recommended. Head to downloads and bring your TAGAP 2 up to date. As always, the mirror list is updated with up-to-date mirrors as they become available. Time for TAGAP 2 v1.3 update. Featured in this update are re-fixed "Easy" co-op difficulty (now it works, honest!) and collision detection bounding box fixes in certain levels. For full list changes see the version history. The update is available as both an update and full installer. Again, since the update is only 1.8 Mb as opposed to 211 Mb full installer, using the update is strongly recommended. Head to downloads and bring your TAGAP 2 up to date. Today Happy Feet headed back home as he got a ride on board a New Zealand fisheries vessel Tangaroa. And he is traveling in style, too, living in a custom-made insulated crate and employing a private veterinary team. Plenty of penguin-lovers and media were there to bid him farewell at the docks. Sadly I wasn't there in the crowd, but in case you have Internet on Antarctica, we wish you the best of luck Happy Feet! Here at TAGAP HQ we've been following the story of the real-life Happy Feet, an Emperor penguin that got stranded in New Zealand and got into trouble for eating sand as snow. Now it seems the story will get a happy ending after all, as not only has the bird recovered from the extensive surgeries – performed in order to get the sand out of its stomach – but he will also be offered a ride home. Happy Feet will be delivered into Antarctic coastal waters, from where his movements will be observed via a GPS tracker. Also on the topic, if you'd like to follow Happy Feet's daily life before he embarks on his homecoming journey, the folks of Wellington Zoo and the local TV3 station have set up a live webcam stream for the waddling sensation. And since we're on the topic of Happy Feet, remember to check out the brand new trailer for his namesake, Happy Feet Two. Time for the first actual update for TAGAP 2, bringing the game to v1.2. The biggest issues squashed in this update are the "Easy" difficulty setting in co-op – which used to be broken – and fixed save/load system so that it no longer can accidentally reset player stats and score. For full list features, see the version history. The update is available as both an update and full installer. Given the update is only 1.7 Mb as opposed to 211 Mb full installer, using the update is strongly recommended. In either case, head to downloads and bring your TAGAP 2 up to date. 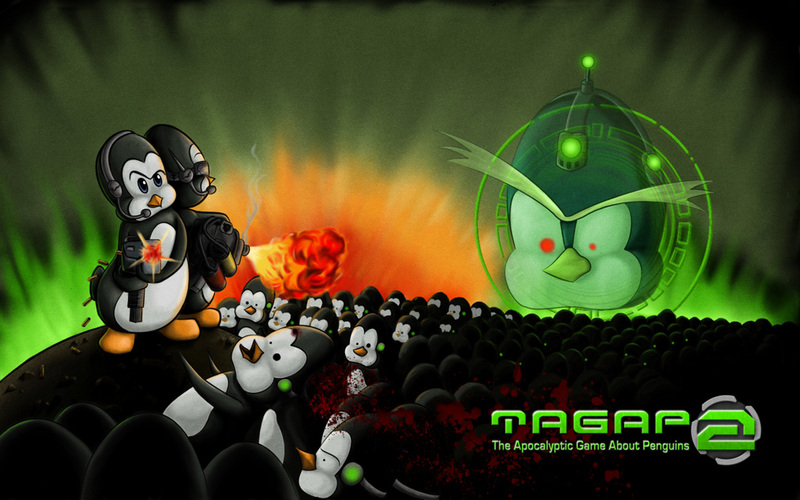 Get TAGAP 2 and join the Second Penguin Apocalypse! We'll keep updating the downloads page with new mirrors as they become available. If you are setting up a mirror or a permanent Torrent, let us know so we can add you to the list as well. And finally, here's the official press release to go with launch. Feel free to quote it or link to it if you can't find to words to describe the penguin insanity that is TAGAP 2. Oh, and happy 4th birthday to the original TAGAP; Play nice with your brand new baby brother! This is it, folks, the final week counting to the arrival of TAGAP 2 and the last TAGAP Thursday for now. And for the occasion, we have something a bit different; A guest artist wallpaper from Heini 'Silveriatha' Liimatta. Inspired by the posters of the exploitation horror flicks of yesteryear, her take on Pablo and Pedro is graphic and gorgeous. A special thanks to both Heini and all of you who have been coming back for this weekly feature. I hope you enjoyed it as much as we enjoyed producing it! All the TAGAP Thursday goodies will remain available for download in our Download Extras section. TAGAP Thursday #20: Final pre-launch blog... and TAGAP 2 manual! Less than two weeks to go! This means TAGAP 2 is almost here and it's time for the very last pre-launch TAGAP 2 blog update. This blog features info on what's going on behind the scenes regarding the impending launch as well as the final stats sheet comparison between the first TAGAP and TAGAP 2. And not only that, but the entire TAGAP 2: The Player's Handbook – aka the game manual – is there for you to read. So why don't you? We're all pins and needles here anxiously waiting for next week, the last TAGAP Thursday featuring a guest artist and, naturally, TAGAP 2 itself! In the latest skirmish of EpicBattleCry, the official podcast of gaming news and community site EpicBattleAxe, the great Pun-isher himself, Daniel Kayser gave a shout out to TAGAP 2. Thank you Mr. Kayser, and everyone at EBA for your kind words! And besides, when the blood-thirsty Viking Brent is amused by the idea of a Penguin Apocalyse, we know were getting something right! The skirmish 125 centers on the interview of Greg Kasavin, the creative director of the interesting upcoming Xbox Live Arcade title Bastion. If you are unfamiliar with the show, EpicBattleCry is an entertaining, BS free look on game news and the video game industry as a whole. If you want to know exactly what's going on in gaming industry right now but don't want to be bored to death while you're at it, there is no better podcast to listen to. This week's Thursday update is a bit different. We've been on several occasions asked if we could produce a 'behind the scenes' feature of some sort. We really haven't done it in the past, mainly because we're pretty sure you don't want to see two dudes just sitting in front of computers with their headphones on. However, there was one day that was worth documenting – and we've done so, now presenting the official Behind the Scenes video for TAGAP 2. Who knows, perhaps after this we'll start receiving feedback from frightened people asking us not to publish more 'behind the scenes' material. For the full description of what's going on, read the latest Making of TAGAP 2 blog update. All good things come to an end; Here comes the last of these new, stylized character wallpapers and it's obviously based on General Primo, the main antagonist of TAGAP 2. His villainous red stare and golden eyebrows make this entry perhaps the most striking one yet. We hope you've enjoyed this desktop series as much as we've enjoyed creating it! Come back again next Thursday for something entirely different. Meanwhile, feel free to browse the ever-growing Download Extras section, which already features 11 TAGAP 2 wallpapers (and more). TAGAP 2 has Gone Gold! This means that TAGAP 2 is ready to roll when the release date hits, now it's all about preparing for the launch (there's more to it than just uploading the files to the Internet, you know). While TAGAP 2 is distributed in digital form, we are going to get some promo packs manufactured – and it's master discs for those I'm verifying as I type. While most of the packs go to gaming press, we are saving a couple of them for competitions / sweepstakes, so keep your eye out for those when TAGAP 2 launches on July 31st. If you are unfamiliar with the term, when a game "Goes Gold" it means the final master discs for manufacturing have been produced. The term originates from the older days when all the CD-Rs were made of gold film and it was always a DIY 'golden copy' from which the retail discs were pressed. Proper modernized term in TAGAP 2's case would actually be "Gone Purple-ish", but it doesn't have the same ring to it, now does it? And the series of stylized character wallpapers continues with Pedro's artwork. While Pablo's stylized promo shot will appear as cover art in both the manual and alternate DVD case, this one will be decorating the back covers. It doesn't take a rocket scientist to figure out that next Thursday we will roll out similar stylized take on the Villain of TAGAP 2, General Primo! Until then feel free to browse, use and share our previous wallpapers and buddy icons found in Download Extras section. According to the latest news, Happy Feet has endured the ordeal, is awake and feeling better! If everything goes smoothly, no further surgery is required. There is still some sand left in Happy Feet's stomach, but the doctors hope it will pass through its system naturally. Past few days I've been following the amazing story of the true Happy Feet, a 10-month-old Emperor penguin who, like his namesake, swam too far out from Antarctica, got lost and landed in New Zealand. At first the wildlife officials decided not to interfere, hoping Happy Feet would leave on its own accord, but unfortunately something happened; As native of Antarctica the poor thing had never seen wide sand beaches before and mistook the sand for snow, eating it trying to stay cool. Happy Feet is now being treated at the Wellington Zoo, where it is undergoing a series of surgeries aimed to get the sand out of its stomach. The situation is pretty serious and everyone – including us at Penguin DT – are holding their thumbs up for the little guy. If Happy Feet survives, it has been offered a cruise back home by businessman Gareth Morgan on a Russian icebreaker set to embark on an expedition to the Ross Sea next February. So, remember to keep your thumbs – or flippers – up for the true Happy Feet! We'll keep you posted on situation. TAGAP Thursday #16: New blog update "Almost there"
Today we take a step back to see where we are on the TAGAP 2 roadmap. In the new blog update we shed light on these last days of TAGAP 2 development, what to expect from the limited promo DVDs and more. Come back again next Thursday when the series of stylized character wallpaper resumes. This Thursday a new series of wallpapers begins; Stylized character wallpapers! Naturally we start of with Pablo. These wallpapers turned out so great that they will be made available as alternate official cover artwork as well. Not only that, but thanks to their simplicity, they will be used in some of the promo material we are about to cook up to support the launch of TAGAP 2. Tune here again next week for more of these stylized character wallpapers. And remember, all the TAGAP 2 wallpapers released so far can be found in Download Extras section. Users of Windows 7 forced to run a version of TAGAP built specifically for 64 bit XP/Vista can now breath easier; With the re-uploaded installers you can choose whether or not to install this special build. This also goes for the update, so if you've encountered problems running TAGAP v1.8 on Windows 7, simply re-apply the update and choose not to install the special x64 version (leave the box unchecked). In other words you no longer need an additional hotfix to fix the issue. Troubleshooting F.A.Q. regarding the issue has also been updated accordingly. Thanks to everyone who contacted us on the issue and made tracking it down easier! The additional character wallpapers introduced past two weeks naturally means this week is about their buddy icon versions. As before, these are also available on our forum as avatars. Next week we start to bring forth new kind promo wallpapers, all very different from these original character spots. So, tune in again next Thursday for brand new set of desktop decoration! 200 Weekly Penguins and counting! It's another Tuesday and another Weekly Penguin. Yes, it has always been so here on TAGAP website, but this one is a milestone – 200th Weekly Penguin! For the occasion I took some time off from finishing up TAGAP 2 and created the first non-TAGAP wallpapers since February. Weekly Penguin has been a regular feature on TAGAP website since the launch of the first game back in summer 2007. And by the looks of things, it will be a regular feature for a long time; While we haven't featured any figurines or plush toys in ages, it isn't because were running out of penguins – with final stretch of TAGAP 2 on our hands we just haven't had the time to arrange a photo shoot! Final entry in the series of these character wallpapers focuses on the Rockhopper elite, Primo's smarter commando penguins. Unlike the zombie penguins of TAGAP 2, these crested birds wield guns, can drive vehicles and even use repelling ropes to ambush you! Again, the now-complete set of character wallpapers can be downloaded from Download Extras section. But don't worry; Though this was the last artwork in the current series of promo shots, there are still plenty of goodies to roll out while July 31st approaches – including exciting art from a guest artist. Now that TAGAP 2 release date is set in web countdown, it's time for more desktop goodies. Today's desktop décor features your most common enemy, the zombie penguins! While there are dozens of different zombie penguins in TAGAP 2, we focused on the one roaming in the sewer level. Like certain British best-TV-series-in-the-Universe has taught us, nothing says 'villain' like a plunger! If you've missed the first three character wallpapers, head to Download Extras section. TAGAP Thursday #11: TAGAP 2 release date! There are several reasons why this particular day was picked, but most importantly it's because the day is close yet it provides us just enough time to wrap up the loose ends and to find launch partners. July 31st 2011 also marks the 4th anniversary of the original TAGAP – and what would be a better way to celebrate it? Unless I experience serious connection difficulties, TAGAP 2 will be available around 12:00 EEST (EEST = GMT + 3h). This TAGAP Thursday TAGAP 2 section of the website expands to its full size with the addition of Characters tab. There you can meet the penguins of TAGAP 2, from Pablo, Pedro and Primo to zombie penguins, the Rockhopper elite and Penguinators. As promised yesterday, here's something we were saving for TAGAP Thursday but decided to offer out-of-schedule as consolation for our mistake; More TAGAP 2 buddy icons, this time it's Dr. Glowenko and the Penguinator. Like before, these icons will be added to our forum avatars shortly. Never say never again, it seems. The updated installer of TAGAP v1.8 seemed have a nasty scripting glitch that prevents some people from installing the game. The glitch is now fixed and the new updated installer is available. I've notified all the good folks providing mirrors for us about the issue and I'm sure they'll update their mirrors as soon as humanly possible. I can't describe how sorry we are about this. I will cook up something for consellation by tomorrow. And here it is, the TAGAP 2 cover artwork! Drawn with pencils and colored with Photoshop magic, Pablo and Pedro are ready to decorate your desktop! As some of you may have noticed, the image is based on the concept artwork drawn in 2007. This particular drawing was an inspiration for the whole project and it was thoroughly described in one of our first blog posts. Like always, this wallpaper and more TAGAP 2 goodies are available in Download Extras section. Now that TAGAP 2 is getting ready for it's debut, we took some time to cook up the final patch for the original TAGAP. Version 1.8 irons out several kinks, including the issues regarding the 'Collector' achievement and the glitchy sound playback on certain older sound cards. In addition to all this, TAGAP now also comes in both x86 and x64 varieties. Both the installer and updater will automatically install the right one depending on whether you are using 32-bit or 64-bit Windows, so there's no need sweat about it. Head to downloads section for your TAGAP v1.8 update. As usual, the update is available as a patch, full setup and the additional backwards compatibility replacement for Windows 98/ME/2000. For the full list of changes, read the v1.8 release notes. If you are experiencing long download times, fear not; More mirrors are on the way. NOTE: This is not TAGAP 2, but the final update to the original game. Stay tuned, TAGAP 2 will arrive later this year! It's been over an year since the previous Questions and Answers update, so this week's TAGAP Thursday is entirely dedicated to answering your questions and inquiries. In this blog post we deal everything from TAGAP 2 system requirements to the reasons why we haven't announced a release date yet. Happy World Penguin Day; Here comes the new TAGAP.net! Today, April 25th, may be just a Easter holiday to most, but for us penguin-fanatics it's also known as The World Penguin Day. The day marks the start of the annual northward migration of Adelie penguins – and the waddlers won't return to their colonies until the Antarctic spring. This day is celebrated as a perfect excuse to dress in black-and-white, to learn about penguins or to do something else penguinish. For us at Penguin DT it marks a perfect opportunity to renovate the entire TAGAP website to celebrate the incoming TAGAP 2. TAGAP 2 section in particular will receive more regular updates as the soon-to-be-announced release date draws closer. Meanwhile, we also added new, even higher resolution versions of the widescreen wallpapers of both 16:9 and 16:10 variety. Also, TAGAP 2 section now boasts a preview shot of the full TAGAP 2 cover artwork, one that will eventually become a full set of wallpapers as well. And while surfing the updated site; Have a fun World Penguin Day! This Thursday we welcome you to take a tour around the menus of TAGAP 2, all the way from campaign level selection and achievements to configuration and the Database. The article, part of "Making of TAGAP 2" blog series, features screenshots covering most of the user interface and naturally has detailed descriptions of each menu page. TAGAP Thursdays being the official day for TAGAP related updates, the weekly feature expands to blog territory. Check out the Status update, April 2011 for the latest happenings on TAGAP 2 front, including preview screenshots of the returning in-game Extras section! Not-so-surprisingly this week's TAGAP Thursday brings forth Primo and TAGAP 2 logo buddy icons. As before, both packs contain three color variants in sizes ranging from 40x40 up to 200x200. This Thursday we present you the official Pablo and Pedro buddy icons. These icon packs are for everyone to use in forums, blogs, Twitter, Steam or where ever! Each pack contains three color variants, all of them in various sizes from 40x40 up to 200x200. Now also available as squeeky clean from branding in Extra Downloads. Knowing many of you prefer to use more toned down desktop images instead of blazing character wallpapers, for this TAGAP Thursday we have cooked up one more grunge-styled TAGAP 2 desktop decor. If the character wallpapers seemed too busy for your taste, this blank logo version is for you. The full quartet of grunge-styled TAGAP 2 wallpapers as well a slew of other penguin extras can be found in Extra Download section. The new weekly feature TAGAP Thursdays continues! Next in the series of goodies is – you've guessed it – a brand new wallpaper of Pedro, TAGAP's villain-turned-hero. In TAGAP 2 Pedro joins Pablo's adventures, either providing explosive air support or entering the fray with Pablo side-by-side in co-op mode. For more TAGAP 2 and penguin goodies, check out the Extras Download section. And remember to come back next week for another TAGAP Thursday! And the TAGAP forums are back online. Join the conversation.. again! So, what has changed? These new forums should be a little more stable than the previous versions. In the past the forums were on a separate server, but this time around they've been integrated to tagap.net. In layman's terms; If TAGAP website is online, so is the forum. TAGAP 2 getting closer and closer, it's time to kickstart a new feature; TAGAP Thursdays, the day for all kinds of new TAGAP 2 extras! The feature starts with character wallpaper of TAGAP's hero, Pablo. And it's about time, too, as the first of these character wallpapers was released back in 2008. Check out the older Primo wallpaper – as well as plethora of other TAGAP and penguin wallpapers – in our Download Extras section. Come back next week for another TAGAP Thursday! This week's Weekly Penguin sums up the Weeky Penguin mini-exhibition that took place in January 2011 at Riihimäki library. The photo was taken when we were disassembling the exhibit, but only thing different from the public showcase is the lack of plexi-glass covering the display case. For the fully detailed summary of these penguins and more, check out at our Weekly Penguin feature. TAGAP 2 single player campaign: Done! I know this doesn't sound much after the other major gaming announcement made today, but still; I just completed the final pieces of TAGAP 2 single player campaign. That's right, folks; The single player campaign is now ready from start to finish, only minor balancing and music work remain on that front. This means once I've typed in this news update, I'll start working on the co-op version of the campaign. We still don't have a specific release date set yet – we'll let you know the minute we set it in stone – but 2011 it is! Now, if you happen to be visiting or passing through Riihimäki, Finland, during the next month, you can head to Riihimäki Library and check out a mini-exhibition of our Weekly Penguins. Yes, our Weekly Penguins! This is exactly what the name suggests, a mini-exhibition; There is only display case full of penguin awesomeness. Then again, a full-blown exhibition of my penguins would've taken over most of the library and they do need some space for them books, right? Still, if you'd love to see the genuine Weekly Penguin items of past, present and future, check it out. I'll put up some photographs of the exhibit for those not able to attend – once Petja has had the chance to photograph it, that is.